With their cool, smooth surface and gorgeous woodwork, antique marble top end tables provide elegance and a sense of history to any living room. Available in a number of colors and styles, these tables are popular with antiques collectors and interior designers alike. Knowing about the many styles and options and where to shop can help you score a great deal on one of these exquisite pieces of parlor furniture. 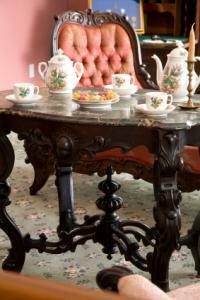 End tables, or parlor tables as they were called in the Victorian era, were used in abundance in the vintage home. Many parlor sets came with a sofa, an armchair, two chairs, and a marble-topped table. Because these sets were so prevalent, marble topped tables of all kinds are plentiful in antique shops in most areas of the country. If you want a large selection of end tables, the Internet is the place to check. There are a number of sites that carry these tables at different price points. You can typically expect to spend between $250 and $5000, depending on the era, materials, condition, and quality of workmanship. With its constantly changing selection of merchandise, eBay is a great place to start your search for the perfect marble end table. You'll find a variety of different styles, as well as items in many different price ranges. When purchasing a piece like this on eBay, it's important to check the cost of shipping. Marble is very heavy, and many listings may be available for local pick up only. Ruby Lane is an online antique mall with an amazing selection. You'll find marble tables from the Victorian era in just about every color and style you can imagine. There are plenty of different options at most price points, but in general, you'll pay more for a table here than you will on eBay. TIAS is another great shopping option. While the selection is much more limited than some other shopping resources, it's always a good idea to check out what the various antique vendors have to offer. Your perfect table may be waiting for you. With dozens of different options to choose from, Go Antiques is another online antique store you can't miss. You'll find tables in lots of different styles, as well as matched sets to give your living room a coordinated look. As you shop, you'll find these end tables in a variety of different styles and materials. Because they were such a popular parlor item, they came in quite a range of options. Most marble-topped end tables have a wood base, although the type of wood can vary. You'll find oak, mahogany, and walnut, as well as options that are gilded or silvered. It's rare to see these end tables featuring painted bases. 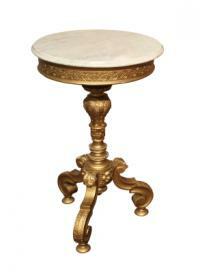 Perhaps the most common shape for marble-topped tables are round options with pedestal bases. However, you'll also encounter rectangular tables, those with scalloped edges, simple square tables, and many other options. The base style will also vary. Some will have three or four legs, while others will have a pedestal or trestle-style base. You'll see very simple lines, as well as elaborate carving. Eastlake - Many marble end tables are part of the Eastlake style. Usually, this type will have a square or rectangular top and an elaborately carved dark wood base. The base may feature spindles, geometric designs, and repeated motifs. Art Nouveau - Toward the end of the Victorian era, the Art Nouveau movement also made its way into parlor furniture. 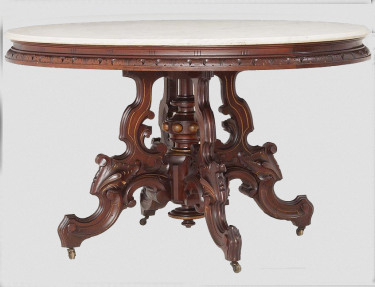 An Art Nouveau end table might feature a round or scalloped marble top and a base that is carved in a figural or flowing design. You may see animals and people in the carvings, as well as many different varieties of flowers. Empire - Popular in the early part of the 19th century, the Empire style featured simple lines. A marble-topped end table in this style may have a round or square top without a scalloped edge. It will have a wood base, which may or may not be gilded, with thin, spindled legs and very simple carvings. Take your time shopping for your antique marble end table. Always check the table carefully for sturdiness if you are buying locally, and be sure to read the seller's return policy if you are buying it from a website. Consider the different options available to find the table that best meets your decorating needs.